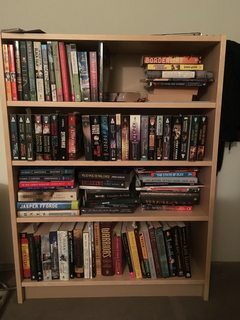 Like many of you, I have a TBR problem. As in, books to be read, as in, way too many of them — and an inability to stop buying more. Some people have a TBR stack, or a TBR shelf. Me? I have a TBR bookcase. I don't have a problem. Not in the slightest. I must have owned the book for at least two years. It must have been published at least five years ago. It must be a book in a series that I haven't touched for two years or more. The book: The Queen of Attolia by Megan Whelan Turner, which qualifies on both the second and third criteria -- it was published in 2000, and I read The Thief, the first book in the series, several years ago. When Eugenides, the Thief of Eddis, stole Hamiathes's Gift, the Queen of Attolia lost more than a mythical relic. She lost face. Everyone knew that Eugenides had outwitted and escaped her. To restore her reputation and reassert her power, the Queen of Attolia will go to any length and accept any help that is offered...she will risk her country to execute the perfect revenge. Eugenides can steal anything. And he taunts the Queen of Attolia, moving through her strongholds seemingly at will. So Attolia waits, secure in the knowledge that the Thief will slip, that he will haunt her palace one too many times. How I found it: I was first recommended this series by my old fandom friend Parron. Her rec was enthusiastic enough that I read The Thief almost right away; I liked it well enough, but not so much that I was compelled to continue. What inspired me to read it now: I finally got around to buying The Queen of Attoliay earlier this year, when one of my favorite used bookstores lost its lease. Sad at this occasion was, I used the moving sale as an opportunity to snap up anything that looked promising, and this book was one of my finds. Then, a few weeks ago, renay started reading it for Fangirl Happy Hour, which prompted much discussion and ultimately spurred me on to choose it as my inaugural book for this feature. It's a good book. I want to say that right away because I really do feel that way. It's got one of the most intricately constructed political intrigue plots I've ever seen, and the author pulls off a number of convincing twists. There are two excellent, powerful, and starkly different female characters — the titular queen and her rival, the queen of nearby Eddis — and the conflict and contrasts between them makes for a fascinating character study. The long-standing friendship between Eddis and Eugenedes ("Gen"), the third main character, is well-developed and satisfying. All things I admire; the politics, particularly, kept me turning the pages. And yet. Even though I've been wanting to kick off this feature for awhile, I hesitated to write this review. Although I liked the book pretty well, I can't say I loved it, yet so many people whom I love and respect adore this book and count it among their favorites. (Is it weird to feel like you've let people down, when you don't love the books that are important to them?) As mentioned above, I can appreciate the ways in which the book is well crafted. But a number of things — personal, idiosyncratic things, didn't work as well for me. In the end, as it so often does for me, it comes down to characters. I've always said that I'm a character-driven writer, and the same is true of my reading — when I'm drawn to a book (or a movie or a video game or whatever), it will almost always be through forming a connection with the characters and investing in the relationships between them. I'll forgive many narrative sins if I fall in love with the characters. On the flip side, if I can't connect with the characters, it becomes much harder for me to sink into a story and get invested, no matter how well plotted or executed, or how interesting the ideas. Unfortunately, there were a number of ways in which I felt The Queen of Attolia kept me at arm's length from the characters. First, large chunks of this book are written in an expository style. That's a sensible choice, given how much time the story covers, but I find that the lack of immediacy in an expository narrative often imposes more distance than I like. Also, in order to preserve the aforementioned plot twists, the author often keeps the characters' thoughts and emotions hidden from the reader. I can appreciate the need for this trade-off, but I noticed a number of moments where we could have been allowed a closer look without much loss of suspense. Finally, many of the characters don't even have proper names — the two queens are always referred to by the names of their nations, and courtiers are often identified via title or their relationship to the queen they serve; even Eugenides isn't a given name but the name of the god of thieves, a mark of his role in Eddis's court. This choice also helps distance us from the characters to whom we should be the most sympathetic. This next bit is cut for spoilers! All this distance kept me from connecting not only with the characters but with the romance, which is the aspect of the story I cared for the least. For me to believe that Gen has carried a torch for Attolia all this time requires me to go along with a love-at-first-sight-and-from-a-distance narrative, and to accept that his affection for her survived being tortured and nearly murdered on her orders. Additionally, I'm really tired of "I hate you means I love you" romance stories, which is how the relationship plays from Attolia's side. Toss in a huge power imbalance, and I was most likely never going to be a huge fan of this romance anyway. But the author's choice to hold all this information for a last minute reveal compounded my distaste. Maybe if I'd been able to see Attolia and Gen's feelings for each other growing gradually, I could've become more invested in their romance, at least to the point that I could root for them to make it work despite all these problems. All that said, I do still find The Queen of Attolia a worthwhile book, and despite my complaints above, I'm still interested enough in the world and the characters that I plan to keep reading. And maybe it won't take me another several years this time. MANY LARGE SPOILERS IN THIS COMMENT. As I think we've discussed elsewhere, I don't disagree with anything you've said! All the weaknesses you've identified are real, and just bothered me less than you. For instance, to me, Gen is such a canonically taciturn character that I wasn't as fussed over the concealing-the-romance thing as you were -- and if it weren't for my very intense love of Megan Whalen Turner's worldbuilding and plot structuring, I think I'd have been more hung up on that and the other character issues than I am. But I suspect I remain, at heart, a plots girl. Oh, and also, I suspect that what Gen feels for Attolia is, at the end of the book, incredibly strong admiration, and he is also aware that theirs would be a politically advantageous marriage. So from that angle, I didn't need to be completely sold on their relationship -- I just needed to believe they liked/admired each other enough that they'd make this sensible political decision together. But it's been a while since I read the book, and maybe I'm under-remembering how in love they profess to be. As I recall, when Eddis delved into Gen's feelings about Attolia, she tried to get him to say that it was just politics, but he was firm that he felt an emotional attachment to Attolia as well. I can't remember for sure whether he used the word "love", but that was the implication I saw. I would actually have liked it much better if it had been a straight-up political marriage, with the possibility of them develop actual feelings in the next book (since that is a trope I love). It's always interesting to me, the way in which what we look for in a story colors our readings of it. I can definitely see why someone who wants strong plots and/or world-building would love these books, while they're less satisfying to me and perhaps others who read for character. Anyways I have been reading this series since the first book came out and I can't be very objective about it. But I can see the issues you mention here and see why they might be problems. I think the thrid book does better at getting into characters heads by introducing a new naïve character as the view point. It's my favourite of the series so far. I totally get that letting people down feeling. There are a few authors I really tried to like and read many books by because my friends loved them but they just don't do it for me. I'm glad that's not just me. I suppose it's because reading and books are something we like to share with each other, and when we can't, it makes me a little sad. Good to know about the third book. I do still plan to read it, and it does sound like that might help. Your comments are actually kind of a relief. So many people love these books. I wanted to love these books. But I don't, and for some of the same reasons you mention. Glad to hear it. :) It can be tough to not love something that other people love, and I know I always find it helpful to know that others agree with me in those cases. Ignoring spoilers willfully, I'm planning on giving this series a try (entirely because of Fangirl Happy Hour actually). I am looking forward to see whether I have similar character issues as you do or if I fall in love as others have - it honestly could go either way for me I think.